Here’s the short version of a very long story: In Spring 2010, former Kyuss vocalist John Garcia appeared at the Dutch festival Roadburn with a battery of European players—among them guitarist Bruno Fevery—to perform a set of Kyuss songs as Garcia Plays Kyuss, celebrating the catalog of arguably the most pivotal band in the creation of desert rock. A European tour followed. Garcia Plays Kyuss became Kyuss Lives! when Garcia reteamed with ex-Kyuss drummer Brant Bjork and bassist Nick Oliveri, keeping Fevery on guitar in place of nonparticipating six-stringer Joshua Homme, who founded Queens Of The Stone Age after Kyuss broke up in the late ‘90s. Using the Lives! 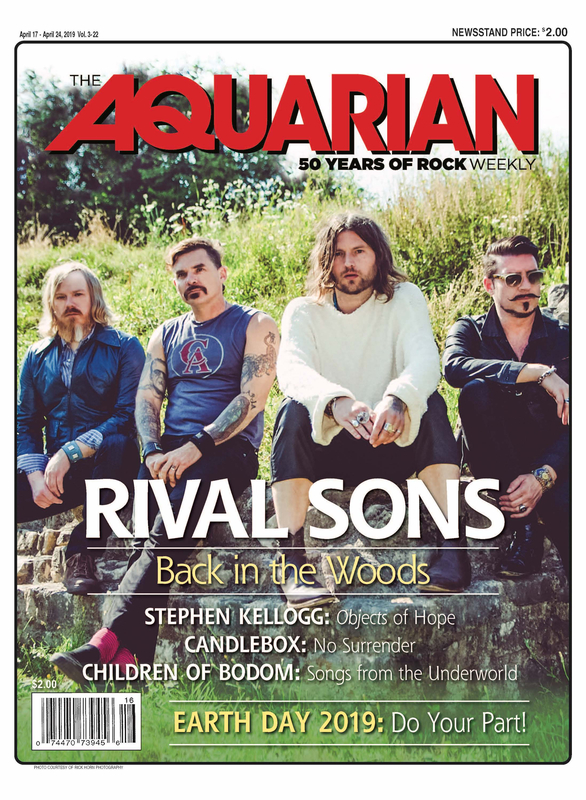 name, Garcia, Bjork, Oliveri and Fevery toured the U.S. and Europe playing Kyuss material (they were on the cover of The Aquarian when they came through the Wellmont in Montclair in Dec. 2011), and it became apparent that a new album was going to happen. Enter Homme and former Kyuss bassist Scott Reeder with litigation keeping Kyuss Lives!—who were pretty clearly skirting the line—from using the Kyuss name. Much drama ensued, but at the end of it, Kyuss Lives! became Vista Chino, Oliveri played on their debut album, Peace, before leaving the band and being replaced on stage by Mike Dean of Corrosion Of Conformity. Kyuss Lives! did their last string of shows under that name earlier in 2013 in Australia (Dean on board), then set to work on Peace as Vista Chino, and though much of the album deals with the themes of hurt and anger at the lawsuit that forced them to change the name, it’s a record that nonetheless both captures the heaviness of spirit and the laid back grooving sensibility of Kyuss but also expands on it, bringing in new ideas and new methods with the songwriting partnership of Fevery and Bjork. Well, in relation to Kyuss back in the day, really the nucleus of the creative process in terms of writing songs was generally Josh and I writing together. It was kind of a yin-yang creative partnership where we kind of bounced our ideas off each other and wrote songs that way. That was generally how things worked in Kyuss, and then John would later put a word or two on it and of course Nick and later Scott would come in later and add their ideas to it. I knew going into this that obviously Josh is not here, I needed to develop a new relationship and that obviously would be with Bruno Fevery, and I knew that was the key to moving forward with our creative chemistry. John is not an instrumentalist. He comes up with melodies. I could feel it. So when it was time to write, Bruno and I just got together. He flew out to the desert, he hung out at my house and we just talked and jammed and just really got to develop a whole philosophical approach to being writing partners. That’s how it developed. The creative process, for me, is always two things. It’s out of emotional necessity—I’m an artist and I’m always needing to be creative and express myself—and also, to celebrate. To celebrate my love of music and rock music in particular with other forms of music like funk or jazz or blues. So it was kind of a combination of those two things. Bruno is obviously a musician and he needs to express himself like everyone else, and also, he loves music. We decided to just sit down and see how can we together express our love of music and simultaneously express what we’re truly feeling. That was really just the foundation of us moving forward in the creative process. I knew that first day of rehearsal, John and Nick and all of us said, “Hey man, we gotta record new material. We gotta move forward with this.” Because I mean, we’re musicians. That’s the challenge. We always want to challenge ourselves and that was a big challenge for us. We committed to it early on. Yeah. I have an entirely different relationship with Vista Chino than I do with Kyuss. Kyuss was a great band. I think musically speaking, we were an impressive band and I’m very appreciative of the people that have come to enjoy the music over the years, but something that I think a lot of fans don’t understand—and it’s actually better they don’t—is that Kyuss was a band just rife with dysfunction. We didn’t really get along all the time. We were four dudes from the middle of the desert, and we just couldn’t have been four more different guys. I think the most extreme example would be the relationship between Josh and I, which, ironically enough, happened to be the two guys that the chemistry was where a lot of the creativity was coming from. But Josh and I couldn’t be two more different guys. To me, it was always a shame, because as much as I loved Kyuss—I loved the band, I loved what we stood for and what we originally were—to me, Kyuss was a blues band. Could you see yourself writing new Vista Chino material with Mike Dean on bass? Oh, 100 percent. We talk about it all the time. At this point in our careers and lives, we’ve all got wives and families and kids and we live in different parts of the world, so having that ability to come in and hang out in the garage and drink beers and jam all day, we don’t totally have that luxury now. It’s just a matter of our yearly schedules jiving. Mike’s still spearheading Corrosion Of Conformity, they’re an amazing band and we certainly want them to exist, so it’s just a matter of getting our schedules to jive, and if we can get our schedules to jive, I don’t see any reason why we wouldn’t start moving into new material all together. We’ll just see how it works out. Peace is available now on Napalm Records. Vista Chino hit Bowery Ballroom in Manhattan on Sept. 26 with Kings Destroy opening and Underground Arts in Philadelphia Sept. 27.